So named by those who work and learn in the building, this “highway” is really a long hallway that cuts across the building. One end of the hallway leads to the Moore Musical Arts Center and the other to the Fine Arts Center. “[We’re] kind of creating our own-large scale village of performing arts,” said Steven Boone, assistant professor in the department of theatre and film. The Wolfe Center is the new building for the Department of Theatre and Film at Bowling Green State University, and it was placed in the particular spot it occupies for this exact reason. Construction on the building began in April 2009, according to a May 2009 newsletter released by the department of theatre and film. The building was opened to the public Dec. 9 and cost $42 million, according to BGSU spokesperson, Jennifer Sobolewski. This is the first semester the building has been open for classes and it will soon be the scene of arts performances. Part of the inspiration behind the building was collaboration between the departments of the arts at BGSU. Prior to the new building, collaboration between the departments of the arts was more difficult. Being across campus in University Hall, where the theatre was before, also didn’t make working together any easier. Now, the Wolfe Center can be used for theatre, art and music students. The Donnell Theatre can be used for orchestras, operas and plays. The different departments share the Marjorie E. Conrad, M.D. Choral Room. There are also digital art labs for art students to work in. 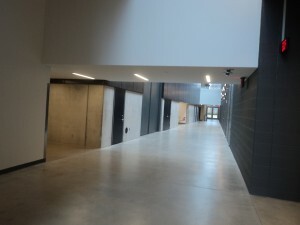 “The great highway,” as the hallway is also called, doesn’t only connect the arts, but it separates the front of the building, which is open to the public, from the back, which serves as a backstage area, said Ron Shields, chair of the department of theatre and film. Along “the highway of the arts” also lies the costume shop, costume storage area, the green room, the scene shop, the film lab, the design lab and the door that leads to the backstage area of the Donnell Theatre. Cierra Kelly, a senior theatre student who has class in the costume shop, uses “the highway of the arts” to get to class. Kelly said the Wolfe Center has increased collaboration between the departments and the new location has helped with organization as well. The collaboration that is now possible between the music department, fine arts department and the department of theatre and film isn’t one without challenges. Cooperation isn’t always as easy as it sounds. Boone said the department’s shows are always better when it collaborates with other departments. This entry was posted on Wednesday, February 1st, 2012 at 5:56 pm	and is filed under Spring 2012, Student Contributor, Wolfe Center. You can follow any responses to this entry through the RSS 2.0 feed. Both comments and pings are currently closed.